Be Protected by the EZ ERISA Plan Industry Leading Warranty! $1,000,000 Warranty Against Penalties for the EZ ERISA Plan Product Documents! If the EZ ERISA Plan documents prepared result in a governmental penalty, we warrant to pay such penalty up to $1,000,000. In the event of a governmental audit or inquiry regarding the documents that are the Product subject to this EZ ERISA Plan Warranty, and the governmental audit results in a penalty to the Subscriber based upon the documents that are the Product of EZ ERISA Plan, even if the Subscriber created the Product documents, or authorized its insurance brokers, consultants, advisors, accountants or advisors, EZ ERISA Plan will reimburse the Subscriber for up to $1,000,000 for such penalty assessed to the Subscriber. Legal Services for Audit Warranty! We will send you an ERISA lawyer if you are audited or investigated by any governmental agency. 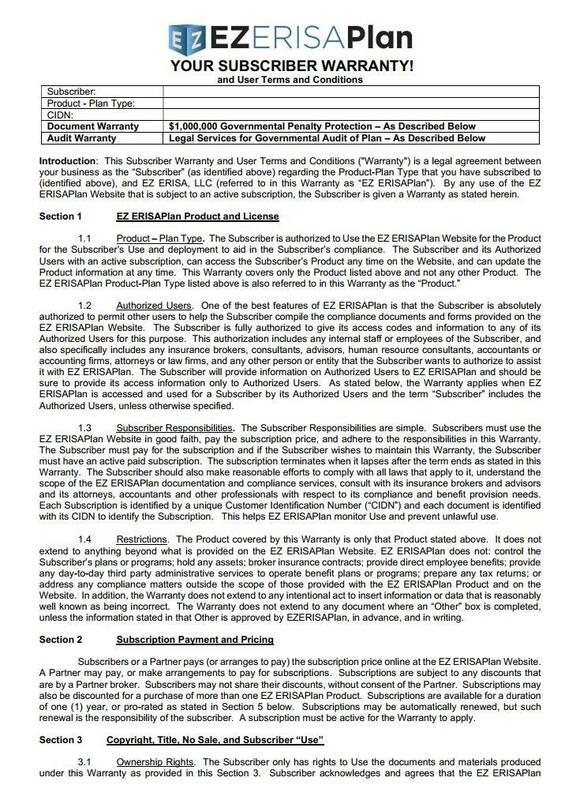 In the event of a governmental audit or inquiry regarding the documents that are the Product subject to this Warranty, including an audit or investigation by the U.S. Department of Labor, the U.S. Department of Health and Human Services, and/or the Internal Revenue Service, regarding the EZ ERISA Plan Product related to the health and welfare benefits of the Subscriber, EZ ERISA Plan warrants and represents that in the event that the Product documents were implemented in good faith by the Subscriber or any insurance brokers, consultants, advisors, accountants or advisors in good faith, EZ ERISA Plan will send to the Subscriber ERISA counsel to represent the Subscriber for such audit and will pay for all legal fees incurred in connection with such audit or investigation! Read a sample of the full Warranty. The EZ ERISA Plan Warranty is simple and straight forward. See additional Notice Requirements and other rules in the sample Warranty. Subscribers receive their Warranty credentials upon completion of their documents.